This model runs in OpenCell and COR and the units are consistent throughout. It describes the complete model without feedback, and recreates figures 6 and 7 from the paper. ABSTRACT: We develop a mathematical model that explicitly represents many of the known signaling components mediating translocation of the insulin-responsive glucose transporter GLUT4 to gain insight into the complexities of metabolic insulin signaling pathways. 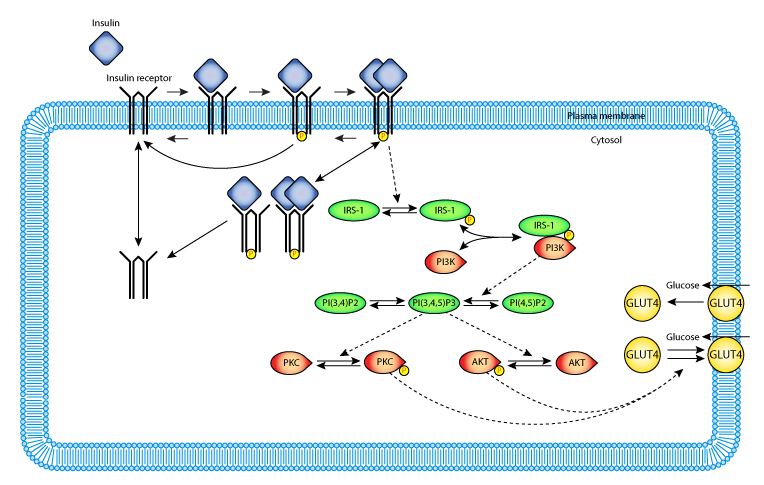 A novel mechanistic model of postreceptor events including phosphorylation of insulin receptor substrate-1, activation of phosphatidylinositol 3-kinase, and subsequent activation of downstream kinases Akt and protein kinase C-zeta is coupled with previously validated subsystem models of insulin receptor binding, receptor recycling, and GLUT4 translocation. A system of differential equations is defined by the structure of the model. Rate constants and model parameters are constrained by published experimental data. Model simulations of insulin dose-response experiments agree with published experimental data and also generate expected qualitative behaviors such as sequential signal amplification and increased sensitivity of downstream components. We examined the consequences of incorporating feedback pathways as well as representing pathological conditions, such as increased levels of protein tyrosine phosphatases, to illustrate the utility of our model for exploring molecular mechanisms. We conclude that mathematical modeling of signal transduction pathways is a useful approach for gaining insight into the complexities of metabolic insulin signaling. Derived from workspace Sedaghat, Sherman, Quon, 2002 at changeset d111840f8557.